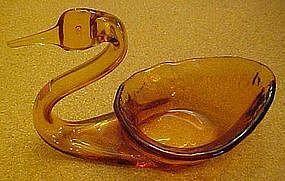 Here is a lovely amber art glass swan that was made by the viking and rainbow glass (a subsidiary of viking) company circa the 1960's-70's. This beautiful hand made amber swan measures 5 3/4"" tall and is 8" long. This swan is in pristine condition with the original Viking sticker. A wonderful addition for your glass animal or viking glass collection.